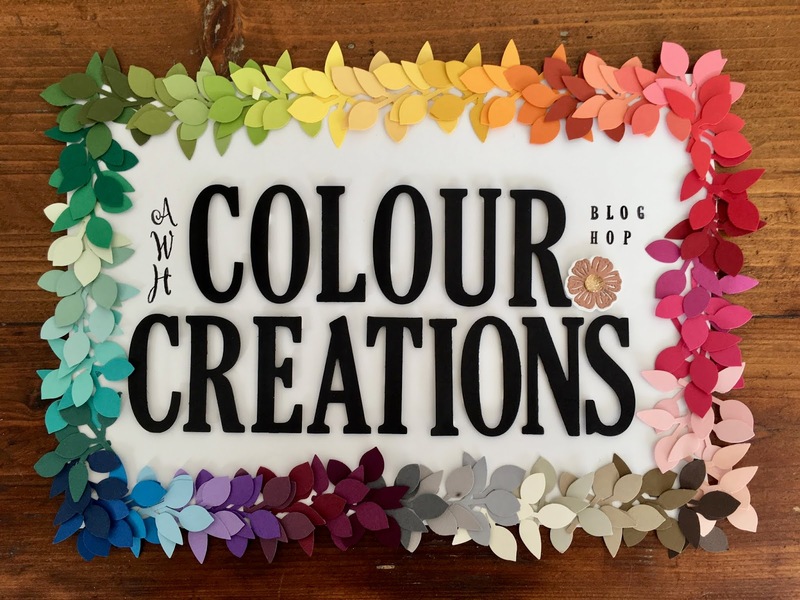 After a couple of weeks away on holiday, I'm back and sharing my project for our Colour Creations blog hop tonight, with the Art with Heart team. 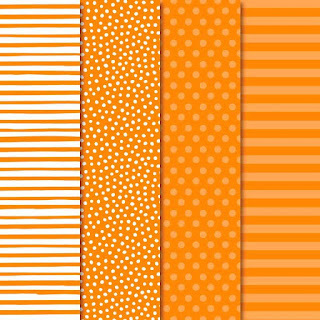 We're up to Week 41 and Pumpkin Pie is our colour this week. 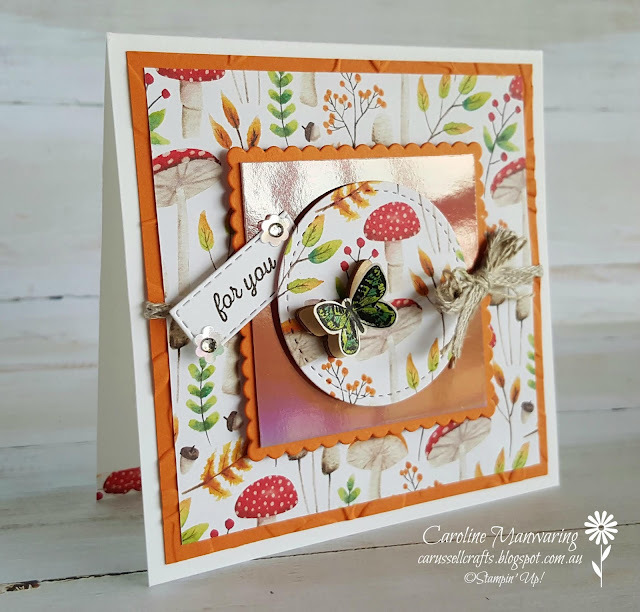 I've made another of my square cards that I love so much, and before we left for our holiday, my Stampin' Up! order arrived, and inside was the Painted Seasons DSP, it's a Sale-a-bration FREEBIE! 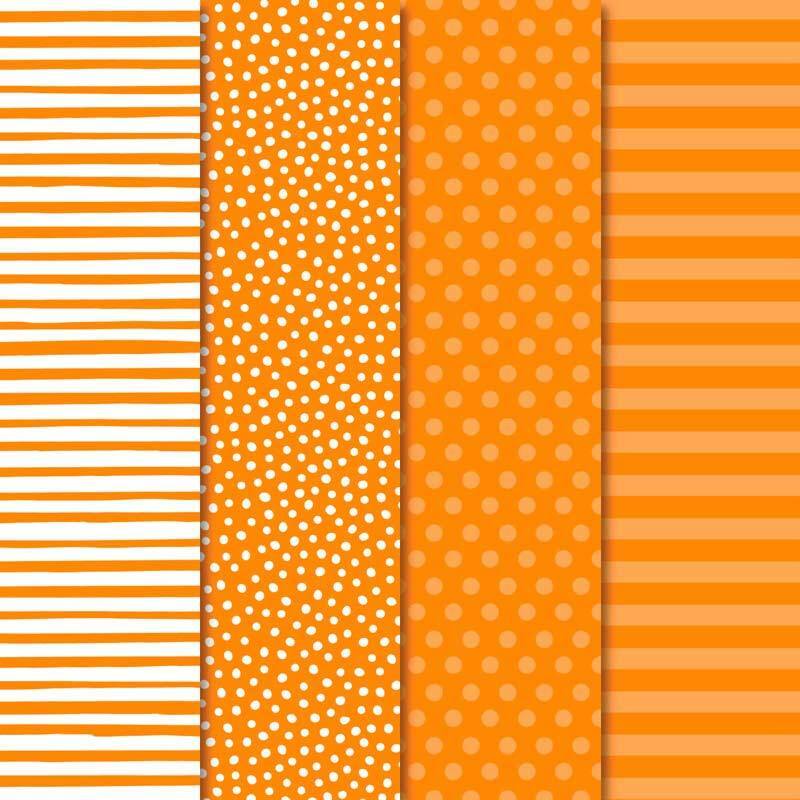 I wanted to use one of the patterns from the pack on my card, and Pumpkin Pie just happened to be one of the colours in this particular design. The first panel is a piece of Pumpkin Pie that I embossed with the Layered Leaves embossing folder. On top of this I as added a piece of the DSP, and then I wrapped a length of the Braided Linen Thread around this whole layer and attached it to the Whisper White card base. Next is the scalloped panel. 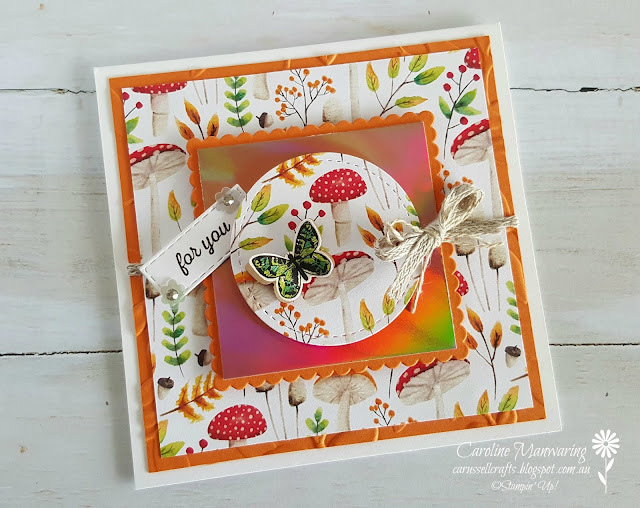 I cut a square of the Grapefruit Grove Foil (from the Sale-a-bration brochure), and added a stitched circle of the DSP, and layered this onto the scalloped square of Pumpkin Pie. I used dimensionals on the back of the scalloped square and the stitched circle. I stamped the sentiment in Early Espresso and it comes from the Itty Bitty Greetings stamp set. I used the smallest Rectangle Stitched Framelit to cut it out. You can make almost any size rectangle, simply by cutting first, and then re-aligning the die over the original cut shape to the length you want. For decoration I used one of the wooden Butterfly Elements and added a small butterfly from the Botanical Butterfly DSP patterns. 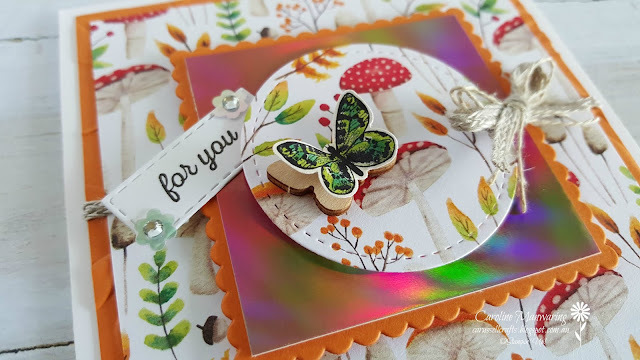 I chose the Lemon Lime Twist coloured butterfly and added more colour with Stampin' Blends markers. The wooden elements and DSP are items from Sale-a-bration. You still have until March 31st to place a qualifying order to choose FREE Sale-a-bration goodies! In this photo you can see the wooden butterfly element better. I made the bow using more of the Braided Linen Thread and some of our regular linen thread, and the little flowers on the sentiment are from the Gingham Gala Sequins in the Occasions Catalogue. I added a clear rhinestone to the centre of them. P.S. If you scroll back up to the first photo, you may just be able to see that I added a strip of the Painted Seasons DSP to the inside of the card. I used the stitched-scalloped edgelit from the Be Mine Stitched Framelits Dies to cut it out. Thanks for stopping by. By using Catherine's link below, you'll be able to see what she and the other team members have created for the hop tonight.